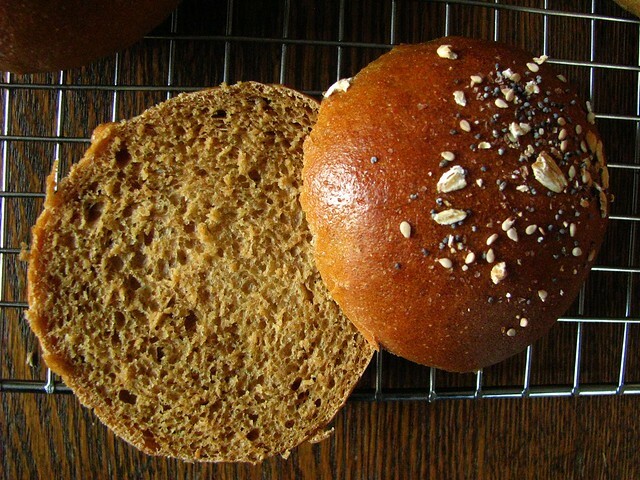 Whole Wheat 'Burger' Buns, and a Healthier New Year. A brand new year, and a fresh blank page: it seems that with each passing year, that happens more and more quickly. I remember this daily now as I think back to when I was the same age as the Kiddo and Christmas hung in the air for what felt like 6 months. The anticipation of Christmas Eve, when our Mexican Feast filled my Gram's little red log home to capacity, was the crown jewel of my year. The week between Christmas and New Year's Eve where we were pretty much free to do whatever and stay up as late as we liked was the best micro-climate of my youth . Even as I got older, I still held Christmas week sacred, using up what vacation time I had to take off most of the time between the 24th and the 31st, to just relax and not do anything related to my normal, routine life. My week this year did not disappoint. I spent it in the company of some of my favorite people, my Parents. We ate frequently and too much, I whined about my sugar consumption, and made my first vow to lay off it for real. We took naps and watched movies. I did my Amish errands to pick up my egg, flour, and sugar staples, and I even ate lunch with my old boss and some long lost 90-year-old friends. I relaxed so much I didn't even have to feed my sourdough starter, since I had fed it and put it into my fridge the day before I left. After a few new days of austere eating (and I've been without sugar now for 3 whole days - outside of a few bites of cream soda creme brulee on New Year's Day), I actually am rewarded with ravenous hunger and appropriate appetite, and those recipes are now completely dogging my every step. When I had only a heel of hybrid sourdough left from two days ago and needed an accompaniment for our soup dinner tonight, I decided to give one of Lukas' burger buns a go - and I am not sorry I did. His headnote states that he's "happy to eat them without anything sandwiched inside", and I would full-heartedly agree. So would both of my picky boys, who ate them and asked for seconds. I made them with the express purpose of having some leftovers for some veggie burgers for tomorrow, but they ended up fueling my excitement for non-wild yeasts! My problem with baking now is that I sometimes don't pay close enough attention to what I'm doing. I was mixing up this dough intending to use whole wheat (strong) flour and bread flour and accidentally opened the jar of AP flour. To a gorgeous caramel colored slurry of water, milk, molasses and a hint of maple syrup, I added 1 cup each bread flour and AP flour, and then added in all of the whole wheat flour as I mixed. My dough was the color of unbaked light gingerbread, and smelled wheaty and slightly sweet - a scent that with 3 days of sugar-freedom I was highly aware of. The recipe below has the flours as written with very few changes from me. 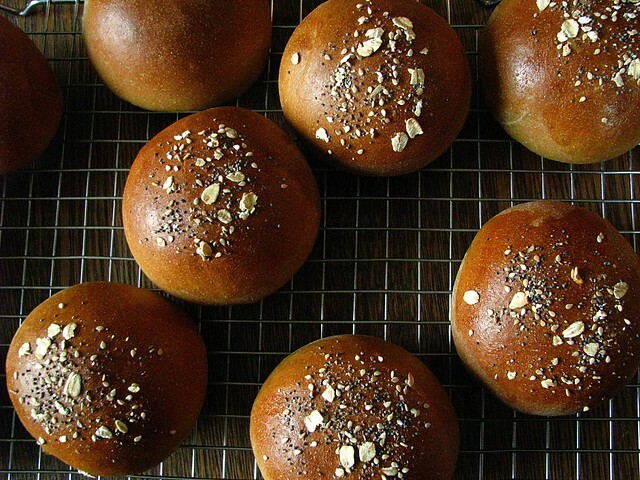 Just be careful not to add too much flour, and these should be some of the softest burger buns you've ever had. In a small bowl, combine water, milk, maple syrup, molasses and olive oil, and stir well to mix. Stir in yeast, and let stand for 5 minutes, until the yeast looks foamy and activated. In a large bowl, or the bowl of a stand mixer, stir to combine 1 c. of the bread flour, 1 c. of the whole wheat flour, and the salt. Add the activated yeast mixture and mix well. (Volger suggests using a paddle attachment at first if using a stand mixer, but I did it by hand with a Danish whisk, and then switched out to let the dough hook do my kneading.) Add the additional flours to feel (add the whole wheat first, since it's only 1/4), being careful not to make too stiff a dough. 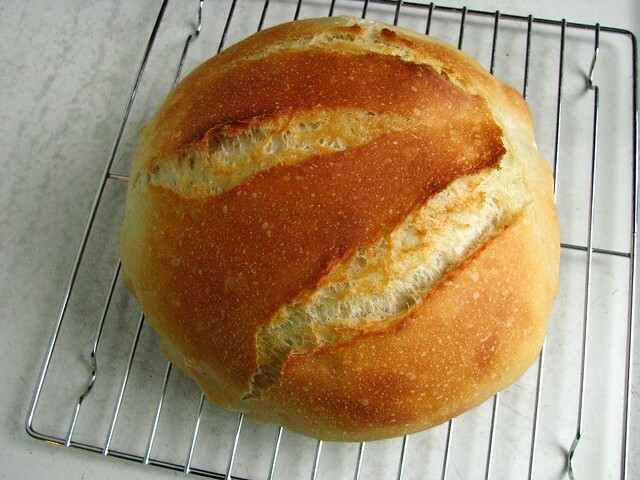 Knead 10-12 minutes by hand, or 8-10 minutes with the stand mixer. The dough will feel smooth and elastic, not really sticky. 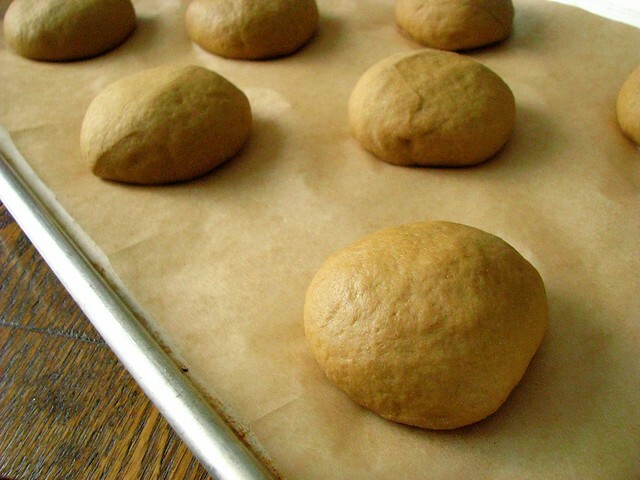 Form the dough into a loose ball. After the first rise, divide dough into 10 portions (I weighed it, each roll was 89 g. or about 3 oz. - a perfect size for a burger), and place on a parchment lined baking sheet. (Place them at least 3-4 inches apart if you don't want them to touch at all, this is 8 rolls for a standard quarter sheet pan) Cover with a lint-free cloth, and let rise until the buns are doubled in size, another 1-2 hours. Towards the end of the rising time, preheat the oven to 400. 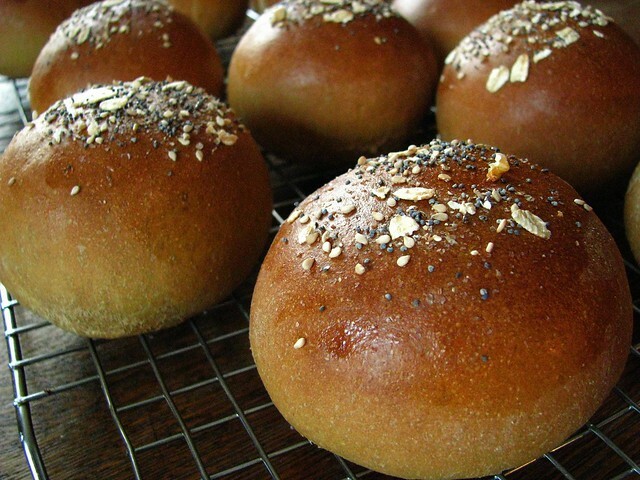 Just before baking, brush each roll with the eggwash and sprinkle with seeds if desired. Bake the rolls for about 15 minutes, rotating the pans halfway through. I know I shouldn't be so surprised when something turns out great, after all shouldn't most published recipes be great? And, don't I know how to bake bread? Why shouldn't I just expect the bread is going to turn out? These could be some of the mysteries that prevent so many people from the the joys of bread baking. But, with each bread attempt, I still learn something. These taught me to realize that I don't care much for heartier Anadama bread, with larger amounts of coal black molasses. I like the flavor of molasses in bread much more when it is tempered to caramel goodness, and soft. Soft bread does have it's place on my table once in a while. a sharp eye will notice the middle of this is just a bit damp. that's because I was too excited to wait for this bun to cool before slicing into it. It is my goal to go without refined sugar for the entire month of January. (Julia and I have a dedicated Sugar-Free January Facebook page here, if you want to check it out or participate.) The blackstrap molasses I used today is maybe technically refined. It is a by-product of the cane sugar industry, but it's not unlike boiling down apple cider into cider syrup, or boiling down pomegranates into pomegranate "molasses". My goal for this month isn't to berate myself and get upset, it's only to be more mindful of my sugar consumption - and this includes my fruit intake too. I love vegetables, but fruits do seem easier to grab this time of year. I'm hoping a book like Veggie Burgers Every Which Way will continue to inspire me to eat differently and appreciate different flavors. Judging from just this first recipe, I have no doubts really. When the month and the year are new, and I feel the same blank slate that many do this time of year, I am happy for the variation in my diet, and thankful that I have the ability to be so choosy about what I eat!